I was just back from a few relaxing days on Ilha do Mel, the island off the coast of Paraná, in Paranaguá Bay. I had wanted to go for many years, as the Island has always been THE destination in South Brazil for those in search of unspoiled hideaways. In the 80s, it was just for the very adventurous as the only option was wild camping. Then it became too popular with surfers and youngsters looking for a party place, so it had lost its appeal to me. But in recent years, the government of Parana decided to implement policies to effectively protect the island, which is an Estate Park, limiting, for example, the number of people that can visit it and banning predatory camping sites, so my interest returned. The island lived up to expectations in terms of nature: there are many deserted beaches and most of its area is part of a nature reserve, closed to the public. You see quite a lot of birds and a lot of green everywhere. In other ways it exceeded my expectations, as it is really well organised in terms of trails, path signs and very clean. The one image that still matched my imagination is that of a hippy-ish hang out place. Somehow it reminded me of beach resorts in Thailand that are in the “gringo trail”, with its simple restaurants, guesthouses and bars with reggae music. So it´s no surprise to find that is a favourite place for a lot of travelling foreigners. But don´t let that put you off- I came back VERY relaxed after a few days there. A very nice place to stay is Pousada das Meninas in Vila do Farol. Although the rooms are very rustic, they are comfortable and the garden is lush and has some cosy areas to read a book or just relax. The staff is extremely friendly and can also help you with day trips- a boat trip to the dolphin’s bay or the fortress is a nice option to see the Bay. The owner of the Pousada has his own boat and can take you there.Or they put you in touch with a local monitor to take you in one of the many trails – Marcelo is a very friendly guy but does not speak much English. My favourite walk was along the beach to Encantadas- you can go walking, have lunch at Pousada Fim da Trilha, the best restaurant on the island, and come back by boat. It makes for a great day trip. In Vila do Farol have dinner at Mar e Sol- it´s the best option there. If you have only a short time in this part of Brazil, and would prefer an organised tour, we offer a combined trip 3days/2 nights of the train journey and Ilha do Mel, starting and finishing in Curitiba. From there you are a short boat away to one of the most fantastic destinations in South Brazil: the Lagamar area, home to the World Biosphere Reserve of the Atlantic Rainforest. Check out our Rainforest Expedition program for more details. 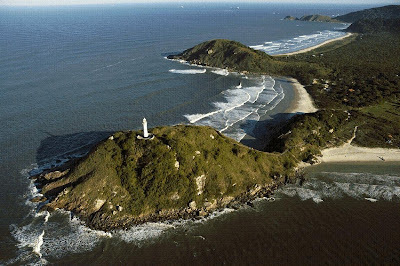 Photo of Ilha do Mel by Priscila Forone.